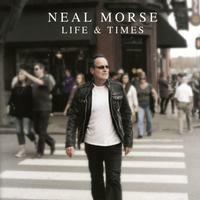 This brand new release from Neal Morse finds him moving from his usual Christian lyrical territory into slice of life stories that seem poignant and personal. Musically he creates sounds that are among the most mainstream and pop-rock based of his career. In fact, this is landed under "progressive rock" at Music Street Journal based on his catalog (both solo and with acts like Spock's Beard and Transatlantic). If I were classifying this based strictly on the music here, it would land under the "non-prog" category. This is a very entertaining and effective set of songs, though. It stands tall with the best of his prog stuff. It just reflects of different side of both Morse the person and Morse the musician. I would like to add that I appreciate the thanks given in the liner notes to those of us who read the thanks. There is a real pop music vibe to this with only a bit of a prog sound. The vocal performance seems to have a lot of emotion and style built into it. The balance between mellower and more rocking is great. I love the various instrumental elements and the female vocals later in the piece lend some extra charm. This is accessible and so classy. Another melodic pop rocker, that balance of harder edged and mellower works really well here. There are some hints of the symphonic prog side of Morse's music, but this is perhaps and even catchier and more pop based song than the opener was. A balladic tune, I love the overlayers on this. The strings add a lot. The whole cut is so pretty and emotional. There is a bouncy folk rock kind of element to the start of this. The cut works out to more of a mainstream, pop rock sound. There is a healthy helping of Americana built into the piece. This ballad is so sad. It's a powerful song with a powerful tale. The reality of veteran suicide has been largely ignored and brushed under the rug. It is starting to get some needed attention, and Morse seems to be trying to help with that cause. He does so with some real emotion. This is more of a mainstream pop rocker. It does have some hints of progressive rock in the mix. I like the acoustic guitar solo on this. There is some exceptional melodic guitar soloing on this tune. The strings and overall arrangement really add a lot. I love the cool, nearly jazzy groove on the piece. The horns add to that jazz thing. A piano based arrangement is the order of business on the balladic introduction to this cut. While this does get a bit powered up later in the tune, it really is a ballad. It's also a nice slice of life kind of number. A bouncy little pop rocker, this is classy and fun. I like the little spoken bit later in the track. This is really a fun-loving number that kind of feels like summer and the outdoors to me. Soft rock with a bit of folk edge is the idea behind this tune. It isn't far removed from things like the band America. It would have been right at home in the 1970s. Julie Harrison provides lead vocals on a lot of this cut. The tune feels like a cross between a folk song and a country ballad. It's slow moving, pretty and quite effective. Picked acoustic guitar starts this cut. The number takes on a real country element. Lyrically this song seems to be about appreciating the time you have on Earth and making the most of it. It's a classy way to end the disc.